The last weekend was very hetic, friends- family- gym took all the time.The result was, didn’t get enough time to do my weekly grocery shopping.So decided to complete the pending work yesterday. We started at about 7:30 to local sainsbury near my residence in Ipsiwch. As usual i was listening to some old loud music, when i heard vishal(my husband) saying,””’have a look outside, it’s a good view”””. By default vishal is nature lover and i am not…i mean nature is 3rd priority for me, adventure and history take the 1st and 2nd place. So i didn’t pay much attention and give a glance outside the car in the direction where he pointed. To my surprise, it was RAINBOW……that too full…i mean the semi-circle of the earth. OMG…….i could see a rainbow. I don’t remember seeing a such crystal clear and dark rainbow where all the colours was visible. I was jumping with joy.The most good part was the rainbow was in front of us…..i felt like i am driving into the rainbow ……can U imagine that …..a long road with a rainbow in between and i am driving into the rainbow…..cool….. I was excited like a small kid…..but than i pondered what is rainbow?A rainbow is an optical and meteorological phenomenon that causes a spectrum of light to appear in the sky when the Sun shines on to droplets of moisture in the Earth’s atmosphere. It takes the form of a multicolouredarc. 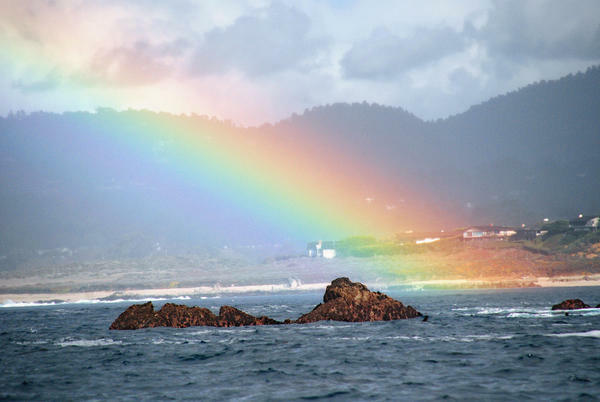 Rainbows caused by sunlight always appear in the section of sky directly opposite the sun. All the colours were visible and i loudly read out all the colours in front of my eyes….beautiful view. Thanks nature for such a spectacular arc. After jumping off the car, i stationed myself in the sainbury’s park for 10mins to watch once in a life time view of the such a wonderful rainbow. It reminded me of all the fairy tales that i read in my childhood.WOW….